This week's Herb of the Week is one of my very favorites – Lavender. A member of the mint family, this very fragrant herb has been used in beauty treatments around the world for centuries. Some of the most popular treatments include aromatherapy, massage, and skin care. In addition to its yummy fragrance, Lavender offers multiple qualities that naturally improve the look of your skin, making it a perfect ingredient for my line of organic skin care products. 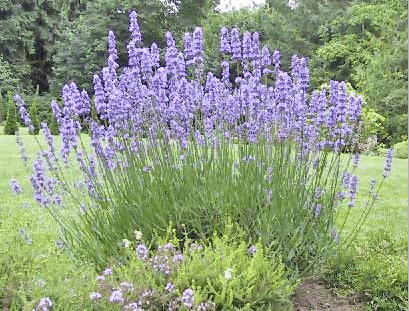 Lavender has long been used for different aromatherapy treatments. Known for its ability to calm the mind, it is often used in massage and spa therapies. Additionally, lavender is used to relax the body and ease tension. It's excellent to keep around for a little-pick-me-up! Rich in linalool, lavender helps the skin look great. It's excellent for those with oily skin. For those who may be suffering from their clogged pores due to an allergic reaction to pollutants, lavender can provide additional relief. Another reason I'm a big fan of Lavender is its ability to help reduce the appearance of wrinkles and other signs of aging. Lavender can help keep your skin looking young, firm, and smooth. Lavender's ability to help with oily skin and clogged pores, as well as its anti-aging properties make it a perfect ingredient in the newest product in my line of skin care products – my dead sea facial scrub. Made with clay from the dead sea, as well as lavender and silica, this scrub is able to provide many of the positive benefits of an exfoliation treatment. Additionally, the scrub softens and smooths skin, as well as provides important minerals necessary for healthy skin. Try adding some lavender to your beauty routine with my Dead Sea Scrub, Anti-Aging Eye Cream, Rosemary Peppermint Body Wash, or even my Coconut Body and Face Oil, and see how it can benefit you! !